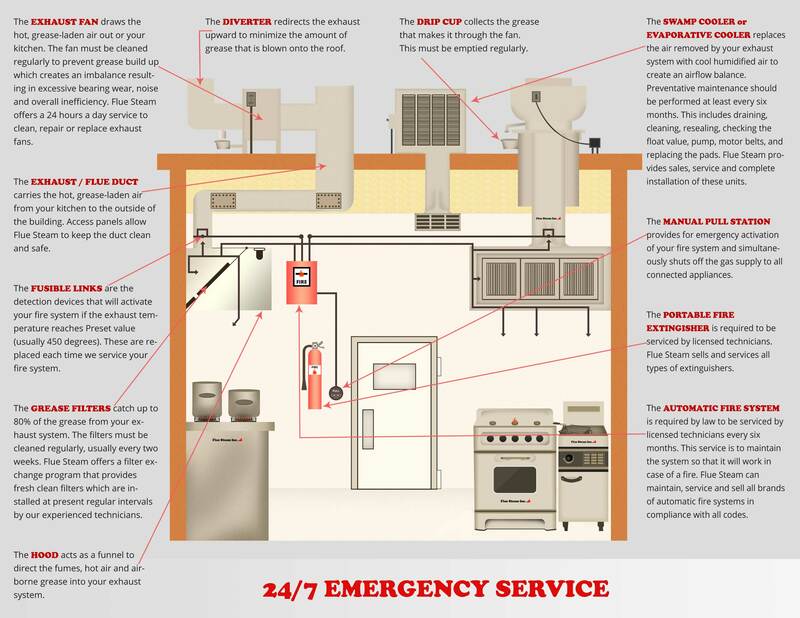 Kitchen exhaust systems remove hot air and odors from your kitchen, but their main purpose is to safely eliminate the vaporized grease that is a natural byproduct of cooking. Failing to keep your kitchen exhaust system clean and in good working condition will compromise its ability to do its job. Once too much grease builds up in your system, you run the risk of dangerous flash fires within your exhaust ducts. These fires mean a call to the fire department and a huge interruption to your business. Hand Scraping – This is a simple and affordable way to remove grease deposits from accessible areas. Many businesses like to have hand scraping done once a month. 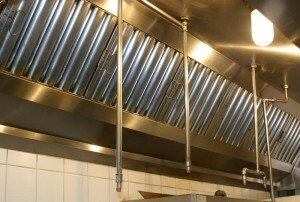 Steam Cleaning – This method uses hot, high-pressure water to remove grease. It is more expensive than hand scraping, but it is also more thorough. Many businesses supplement monthly hand scraping with steam cleaning 2 to 4 times per year. Certificates – We provide “Certificate of Performance” stickers after each job as proof that you have fulfilled your NFPA code obligations. Our stickers not only keep code inspectors satisfied, they can also help you save money on your insurance bills. Unlike other companies that claim to provide total exhaust system cleaning but focus mainly on your range hood, Flue Steam’s licensed technicians really do try to reach every inch of your kitchen exhaust system. We start with the hood, but also clean the exhaust ducts, drip cups, and exhaust fans. We can even install code required access panels in your ducts to enable you to receive an even more comprehensive kitchen exhaust system cleaning. Because the safety of your kitchen is important to us, every regularly scheduled cleaning visit also includes an exhaust fan inspection. We will check the belts and other parts as well as grease your fan bearings. If your belts are worn out and you have a replacement on hand, we will even install the new belt at no additional charge. We want to make sure your exhaust fan is drawing properly, so that your system stays cleaner longer.